When trying to break a non-compete, it is very common for an employee to raise the affirmative defense of unclean hands and air his ex-employer's dirty linens. Rarely is this defense successful. As I noted last month, the defense often revolves around an employer's practice in hiring employees away from competitors. This is not really a defense at all, for there often is no connection between recruitment practices and protection of a customer base relating to a departing employee. A Texas appellate court recently offered a second example: failure to pay commissions owed. In some cases, this may amount to a material breach of contract - meaning the employer cannot enforce a non-compete contained in the same agreement. 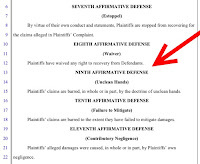 But it is not a defense based on the employer's unclean hands. 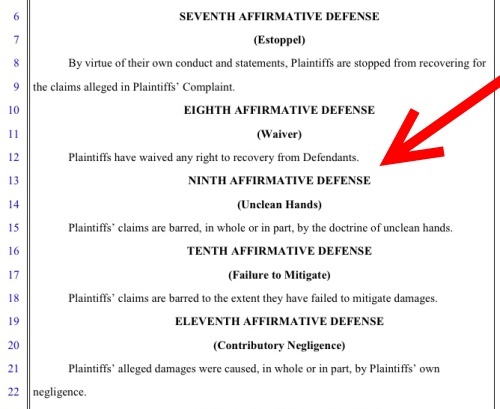 The nature of that defense means the wrongdoing must be connected to the same matter raised in the litigation. The unclean hands defense is sometimes successful. Suppose, for instance, an employer ordered an employee to overcharge customers or to allocate territories with a marginal competitor. A subsequent attempt to enforce a non-compete could run into a problem under the unclean hands defense. Enforcement of a covenant would undermine any protectable interest in the non-compete itself. Under the above example, a pricing structure or market allocation scheme may not be confidential (and hence protectable); it could be illegal. The defense would relate to an element of proof the employer would have to establish regarding enforceability, and so the unclean hands doctrine may properly apply. As a general rule, the unclean hands defense is exceedingly narrow and only rarely will prevail. Courts are wary of employees who assert a vague list of employment grievances wholly unconnected to the restriction. Ken: A good post. Isn't this really just the difference between the "first breach defense" and the "unclean hands doctrine?" Dan: I agree. I've noticed something on the first breach doctrine. If the non-compete does not contain a promise to pay salary, benefits, etc. (in other words, the agreement is just a covenant and not really a contract expressing the complete terms of the employment relationship), a failure to pay salary, bonus, incentive compensation may not be a breach of the covenant. In other words, it could be entirely unrelated to the purpose of the written agreement and therefore may not be amenable to the first breach defense. I'd be interested in your thoughts on this. Admittedly, the equities may weigh against the employer in this situation, but the distinction may be important.